Treat mom to something extra special this year—jewelry made just for her! Artisan jeweler, Christina Kober is hand-stamping names, dates, and sentimental phrases into her beautiful sterling silver jewelry. 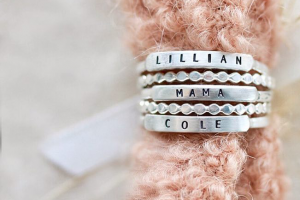 Select a style, size, and text by April 15th and Sticks and Steel will have your special piece ready to gift by Mother’s Day. Place your custom order online or in-store!